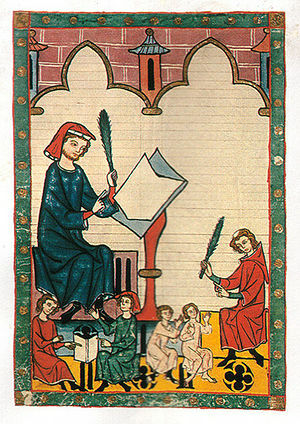 An illustration from the Codex Manesse (1305-1340) showing a medieval school scene. An illustration is a drawing, painting, photograph or other work of two-dimensional visual art that elucidates or decorates a story, poem or other piece of text (such as a newspaper article) by providing a visual representation of something described in the text. A drawing published without accompanying text is not an illustration. However, the same drawing can become an 'illustration' the moment it is used to illustrate a piece of text. A cartoon is a border case, as cartoons often do come with text, but the text is little more than an attachment to the picture, and the artistic focus lies on the drawing. The panels of a comic are not illustrations because they do much more than just illustrate a story; they narrate the story just as much (or in many cases, more) than the dialogs and captions do. Some comics don't use any text at all. An artist who creates illustrations, such as Norman Rockwell, is called an illustrator. This page was last edited on 24 October 2008, at 18:20.